Just ten days before the 1906 Vanderbilt Cup Race, pharmaceutical magnate George McKesson Brown of Huntington purchased the #7 Mercedes to compete in the race. He selected veteran driver William Luttgen (left) and his mechanician Joe Marx (right) to lead his racing team. Brown also commissioned photographers Spooner and Wells to document his new Mercedes in a scrapbook with photos taken before and after the race. 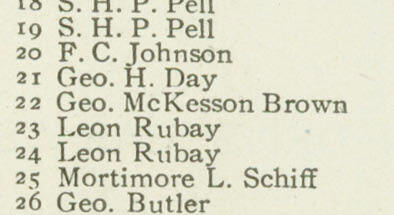 This scrapbook remained in the McKesson Brown family for the last 104 years until purchased by a collector last month. The scrapbook's 22 never-before published photos (including this photo of Luttgen and Marx) and three pieces of Vanderbilia will be featured on VanderbiltCupRaces.com throughout the summer. The first item from the scrapbook is this box seat ticket for the "William K. Vanderbilt Jr. Cup International Automobile Race" held on Sunday, Ocotber 6, 1906. The cost of the ticket was $10 equivalent to $236 today. The box seat location was Box 22, Row B, Seat 5. The ticket looks like it was printed last week. 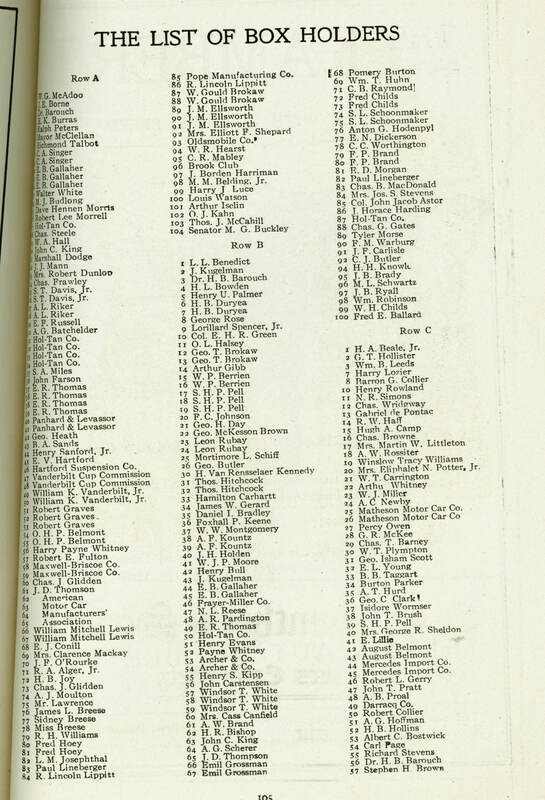 The Official Program Guide for the 1906 Vanderbilt Cup Race provided this list of box holders. It confirms that the box at Row B, Box 22 was purchased by George McKesson Brown. 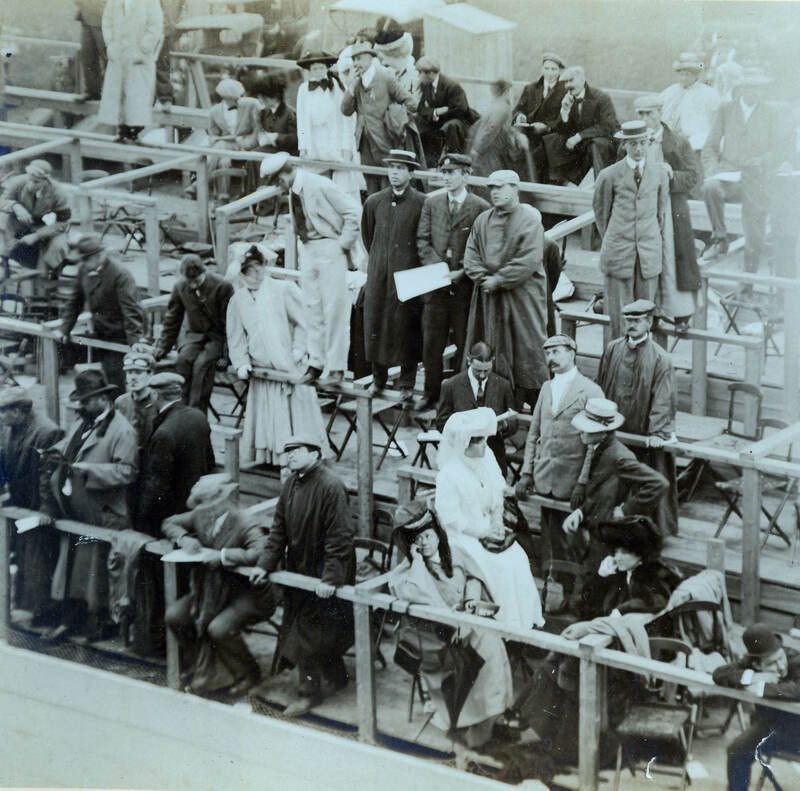 This Spooner & Wells photo was taken from the roof of the Officials' Stand/Press Box across from the 1906 grandstand. I believe George McKesson Brown (middle of photo) is the gentleman wearing the tie in the second row looking down at a program. Brown was the half-brother of David Bruce Brown who competed in the 1910 Vanderbilt Cup Race. His family was one of the founders of McKesson Corporation. This 1906 Vanderbilt Cup Race film shows McKesson Brown's #7 Mercedes in action. The car finished 11th of the 17 entrants.